When major companies with loyal fans undergo significant logo changes, there is often a crowd forming ready to hurl negative reactions. Car-sharing service Uber finds itself on the receiving end of the critical dismay after recently launching a new brand identity that was quickly dissed by artists and Uber drivers alike. As the new look launched, Wired published a behind the scenes look at the two and a half year process that ended with the company’s lead designer leaving (even though he says it was because the launch went well). While there are plenty of lessons to learn from Uber in what not to do, there were some surprisingly good aspects as well. Rebranding is a common struggle for churches, too. Here are some of the key lessons from Uber’s experience that will help you handle the process better. There is nothing inherently wrong with doing brand redesigns in house with a select group of people. After all, design by committee, where too many people with the wrong skills are at the table, rarely works. But a closed process like this can lead to a group think mentality where perspective is lost, procedures don’t allow for true creativity and processes are drawn out too long. Uber lost focus on the end user. I’ve seen the process mentioned above first hand in a church I previously attended (and I bet you’ve experienced it, too). The lead pastor had a small group working on a new logo where there wasn’t respect for the opinions of marketing folks in the room. The church ended up with a logo the pastor wanted, but it felt dated. It didn’t represent the church’s culture and worst of all, it didn’t share the right message with the community the church wanted to reach. By many accounts, the voice of the customer was lost in the Uber process as well, especially in the first 18 months of the process. The managers involved in the redesign kept fine tuning the new branding into something they liked with symbolism they believed represented users. It turns out, the public doesn’t see it. Your personal design aesthetics are not necessarily those of the people you serve. Always keep your end-user in mind and test your concept with a select group of them. I guarantee you’ll find ways your design isn’t communicating the way you expected. Uber found a theme for why they designed what they did. Many times a rebranding process starts with the notion that it’s time for a new logo without much thought on what comes next. While Uber execs had a bit of the same blindness, they did eventually land on a concept for guiding what the new design should be. They developed a concept of “bits” representing the technical side of Uber logistics and “atoms,” representing the people the company served. While a bit abstract, the bits and atoms guidepost made it easier for the design team to say yes to the right ideas and no to others. It was a framework that lead to an app icon design with a textured background (atoms/technology) with a solid shape on top (bit/Uber user). Uber localized their content. In the later stages of the project, when the group realized they shouldn’t be designing just for the CEO, the design team realized that’s tough for a global company to create one look to appeal to all of their diverse customers. 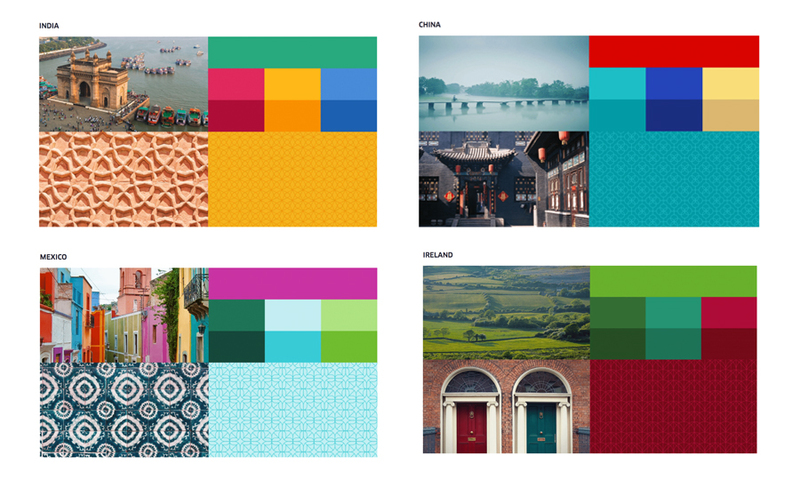 Consequently, Uber created 65 different mood boards with specific colors and images that would be used in different parts of the world. Churches have fragmented audiences as well. While it’s best practice to have a single church brand, there are various audiences where you will tweak your message. You’ll communicate differently to men and women, youth and adults or long time members and new guests.